Just last week, our friends at FICO reported a few of their observations and warnings about the current credit market. There is some positive and negative findings for clients within the report that you may want to discuss with them. First, small business lending is increasing, and the trend appears to be stable. This is welcome news, and is long overdue. The hoarding of cash by banks and other financial institutions has been met with much criticism; this is a strong sign that this problem is coming to an end. As the average credit score increases, we should see a return to easier access to credit across the board. FICO did sound the alarm on a potential housing bubble. A sizable minority of homeowners are still underwater even though residential home prices are rising. Mortgage experts feel that this is a very volatile situation, one that is unsustainable and recession-inducing. Your customers count on you to keep updated on the latest happenings with banks and other lenders. Time will tell if their fears are right, but it’s best for all of us in the industry to remain abreast of these trends. In times of economic crises, the credit repair industry is exceptionally valuable, as lenders tighten their standards and decrease the amount they are willing to lend. While we are unlikely to see another recession like 2008 anytime soon, it is still vital for consumers to keep their credit scores in the best possible shape. Are Mortgage Lenders (Finally) Coming Around? With the recent news of the slight economic uptick, I thought this would be a good opportunity to share an article from the Chicago Tribune. Last month, the newspaper reported that many banks are considering loosening their credit score requirements for mortgages. Wells Fargo has already reduced their minimum score for an FHA loan to a 600 FICO. More emphasis is being placed on an applicant’s debt to income ratio and employment history. Borrowers have shown to be more financially responsible in the current economic climate than when the recession hit, which gives lenders increased optimism that they will see their loans paid back on time. A few days ago, an article in the Motley Fool detailed a study by the Consumer Financial Protection Bureau that shows how catastrophic medical debt is hurting Americans’ credit scores. People are being forced into bankruptcy over outrageously high medical bills, even when they have “adequate” insurance. Double billing and clerical errors are rampant; and consumers are trapped in a tangled web of confusion. In some cases, collection agencies are using unscrupulous methods to try and collect on the outstanding balance as well. The study also showed that even people who otherwise pay all of their bills on time have struggled with the high cost of healthcare. Bad Apples Cost You Money! As we head towards the half-way point of 2014, it is important to assess how we go about improving the image of the credit repair industry nationwide. Unfortunately, a few bad apples can ruin the reputation of many reputable businesses in the eyes of merchant account providers and others. CMS is always looking for ways to help with this problem, and we count on our clients to give us feedback and advice on how to best accomplish this. Shady companies that scam and bilk their customers are all too often the face of the industry. This results in processing rates and fees increasing, costing the good guys money for something that they had no control over. In addition, public perception is also skewed as the media tend not to focus on the vast majority of credit repair businesses that do right by their clients. We all know just how quickly negative news spreads, and how hard dedicated business owners have to work to counteract the harm done. Networking is often heralded as an essential and reliable means of increasing B2B and B2C sales. We at Capital Merchant Solutions agree wholeheartedly. Mike Citron, who runs DisputeSuite, provides an excellent opportunity to network with your credit repair industry peers every six months called the Credit Boot Camp. At every Boot Camp, industry leaders converge and discuss important trends within the credit repair market, meet with business owners like you, and provide a forum to establish new and valuable business contacts. Capital Merchant Solutions is now a full member of the National Association of Credit Services Organizations. NACSO is the number one credit repair certification board in the country. Members are reviewed and accepted based upon their commitment to furthering the industry while operating at the highest ethical standards. Becoming a member can bring significant benefits to your credit repair business. Customers want to be sure that they are dealing with a reputable company, as their financial well-being is in your hands. Showing that you comply with NACSO’s ethics goes a long way to ensuring trust amongst your credit repair clients. Displaying NACSO’s membership seal will show your customers that you go the extra mile to ensure quality customer service. CMS is dedicated to improving the image of the credit repair industry, and we want you to know that when you sign up for a merchant account with us, we go to bat for you. Similarly, NACSO goes to bat for the industry by engaging in constructive conversations with state and federal lawmakers. They do a lot for the industry by clearing up misconceptions about credit repair; and they work tirelessly to give credit repair merchants the respect and recognition they deserve. We are also on the membership committee; so if you have any questions about obtaining certification for your credit repair business, don’t hesitate to ask. CMS is very proud of this relationship, and we are eager to show you why it can help you grow and succeed. Are You A Target For Fraud? Credit repair merchants are constantly on the lookout for fraudulent charges to their merchant account. Some customers may file a chargeback after work has been performed, or may refuse to pay altogether. Recently, there has been an uptick in businesses across the country getting hit with fraudulent transactions. In one particular scam, fraudsters will access your shopping cart or virtual terminal through illicit methods and try to authorize thousands of credit cards against your credit repair merchant account to see which ones are still active and able to be used. Unfortunately, this trend shows no signs of slowing down. 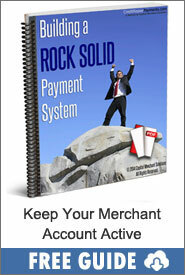 Some merchants have lost thousands of dollars due to the merchant account and gateway transaction fees. Even though these transactions are invalid, processors are under no requirement to waive the associated costs. While fraud is never 100% preventable, there is a solid solution in place within our payment gateway to help lower your risk. With our Fraud Protection system, transactions are screened by front-end filters, which you can set based on dollar thresholds, IP addresses, and transaction volume. Before the bogus charges ever hit your merchant account, they will be checked against your set parameters and held in queue for your review if flagged. This prevents hundreds or thousands of unauthorized transactions from being processed on your dime. While credit repair merchants are at no higher risk than other industries to be hit with this type of fraud, it is very important to have all bases covered when processing payments. Our Fraud Protection system is simply your best line of defense against credit card scammers today. Contact us today to get started, or feel free to let us know if you have any questions about this invaluable tool. Do you watch much TV? Have you seen the recent advertisements for Discover offering FICO scores for free? If not, check out the details online. Nearly every customer will be able to view their FICO score on their month-end statement at absolutely no cost. It’s good news for their cardholders AND your credit repair business. An informed customer is a valuable customer. When clients come to you knowing exactly where their FICO sits, it makes your job of helping them that much easier. Further, if they have taken the initiative to find out why their score is lower than they want, it makes the initial consultation go smoother as well. As you help them improve their credit score over time, they will be able to see the results every month without having to pull their own credit report. It’s likely that other banks and card companies will soon offer a similar service to keep them from being at a competitive disadvantage, according to Bloomberg. The more, the merrier. Discover’s rollout will help thousands of your potential customers wake up to their financial reality. This means there is a brand new market for your services, and you have just the skill set needed to help them achieve their goals. That’s good news for everyone! When accepting payments for your credit repair services, make sure that your merchant account is specifically approved to accept credit repair payments. If your account gets shut down due to being improperly set up, it won’t matter how much business gets sent your way, because you won’t be able to get funded. Look forward to an influx of customers from offerings such as Discover’s, but be prepared by having a credit repair merchant set up and approved through Capital Merchant Solutions. As 2014 rolls on, it is important to assess how we go about improving the image of the credit repair industry nationwide. Unfortunately, a few bad apples can ruin the reputation of many reputable businesses in the eyes of merchant account providers and others. Capital Merchant Solutions has spoken with hundreds of credit repair businesses over the last decade, and we know the very real fear that many of you have about unscrupulous people tarnishing the entire industry. Shady companies such as the one described in this Wall Street Journal article are all too often the face of credit repair businesses in the media. This skews processing rates and fees higher, costing the good guys money for something that they had no control over. It is a sad reality that many processing banks do not differentiate between upstanding credit repair business owners and the ones who cause all of the trouble. That’s where we come in. We at CMS realize the value that you provide, and use our experience and leverage with the banks we work with to provide you a merchant account at reduced rates and fees. Getting set up with a merchant account to legitimately accept credit repair payments is one of the most important things you can do to help your business grow. Make sure that you are set up to accept credit repair payments, and not general services like “business consulting” or “document preparation”. When a bank does an audit on their internal accounts, you risk being shut down and having funds held for up to six months. CMS will get you approved quickly, honestly, and accurately. Let us all work together in 2014 to continue to improve the standing of the industry with processing banks, merchant account providers, and the general public. Why do customers seek you out? Sure, the simple answer is an improved credit score. They want the 50 or 100 point bump that eliminating inaccuracies results in. But what does having their credit repaired actually mean to them? To some people, fixing their credit means getting the mortgage approved. To others, it’s a new car, moving into their first apartment, or even landing a better job. The reasons for wanting better financial standing are endless; it is up to you to determine what makes each customer tick. Your credit repair services need to speak to their needs. It’s not about what you have done in the past for your other clients. It’s about how you can help them improve their lives today and in the future. No matter the reason for their low credit score, they are coming to you for help, putting their trust in you, and paying hard earned money to achieve financial restoration. Help them to help themselves by fully grasping what it is they want out of the process. Don’t approach every credit repair consultation the same way. Find out why they’re speaking with you in the first place. Help them visualize a tangible goal. You’re not just improving a number; you’re giving them the keys to a new home or placing them in their dream car. The work you do will change their life, but they need to be able to see the end-game. Don’t undersell yourself or the credit repair process, let them know that they are getting their money’s worth by using your business instead of trying to fix their credit independently. Customers are not short on options, so by all means let them know why you are better than the next person at helping them to accomplish their goals!